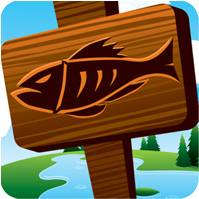 Apps For Anglers provides the most innovative fishing experience available today. The iFish series of Apps offer fishermen across the country a user-friendly and intuitive guide to fishing. Perfect for everyone, from beginners to the seasoned angler. Easily find a lake near you and view detailed information on it. Get real time lake reports, weather conditions and best fishing times. Review and mark your favorite HotSpots, record your catches and learn tips, tricks and techniques. Get it today and Fish with Attitude. "This is the perfect app for all those fishing lovers. I would recommend this app for everybody. I learned things with this app about lakes I fished my whole life!" Need a custom app made? We do that too! Check out www.TheAppDoor.com for more info!